Dorset-based Exhibition Stand Specialists, Quadrant2Design, have donated five new banners to Prama, a charity providing professional home care for those in need of assistance. For over 30 years, Prama has provided professional home care for those who require assistance. From rising and dressing, to domestic support and sitting services, Prama gives people independence within their own home, and also allows friends and carers to take some time to themselves, safe in the knowledge that their loved ones are happy and secure. Prama’s main aim is to help older people and vulnerable adults enjoy their independence, while being able to stay in their own homes. Through the aid of professional carers, the charity are able to provide this support to residents throughout Dorset. Prama do not only provide home care, but also run clubs and activities, known as Prama Plus, so that people have the opportunity to meet and enjoy new members of the community in a social and safe atmosphere. Prama’s charitable work is supported through donations primarily given by supporting members of the public to their charity shops in Parkstone, West Moors, Tuckton and Kinson plus other fund-raising activities that keep this fantastic cause alive. This January saw Prama receive a donation from local Exhibition Stand Specialists, Quadrant2Design, of five portable banners. 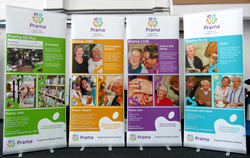 The banners depicted the different elements of people’s lives that Prama is involved in, and all of the services they provide, including their charity shops, the home care, Prama Plus, and Prama Jobs. Using the organisation’s bright colours and engaging words, the banners are sure to attract lots of attention wherever they go. These banners will first be seen in action at the Bournemouth Echo’s Job Fair which takes place on 11th February at Westover Road’s Premier Inn. Prama will be showcasing the charity at the fair, looking for people to join their rewarding and exciting care-team. To discover more about Prama and the services they provide, as well as learning more about working for the charity, visit http://www.pramacare.org.uk. For more information about Quadrant2Design, contact designteam(at)quadrant2design(dot)com or call 01202 723 500.